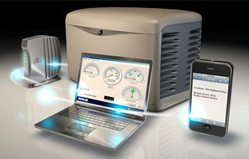 Generator Installations – Need backup power? We can install either manual generator transfer switches that you plug into your portable generator, or fully automatic transfer switches complete with a variety of Kohler generator choices. Please contact us for more information. Your home is a busy place. And a commercial-grade KOHLER® automatic home generator keeps that rhythm going by providing dependable protection during unexpected power outages. Available with 8.5 to 100kW output capabilities, KOHLER® home generators provide worry-free emergency power to support your electrical needs for days, or even weeks. Clean, quiet, automatic backup power - just what your family needs to be safe and comfortable. Critical power applications are part of every industry; protecting them starts with reliable KOHLER® generators, available in diesel, gas and LP configurations. Our EPA-compliant diesel models deliver dependable power to a wide range of output requirements. From small-load residential and business to heavy industry, every KOHLER generator is engineered to provide maximum power, performance, flexibility and fuel efficiency. KOHLER's remote monitoring products are designed to let you see and manage your generator system from multiple locations. These accessories will notify you when your generator starts operating and when it needs attention.